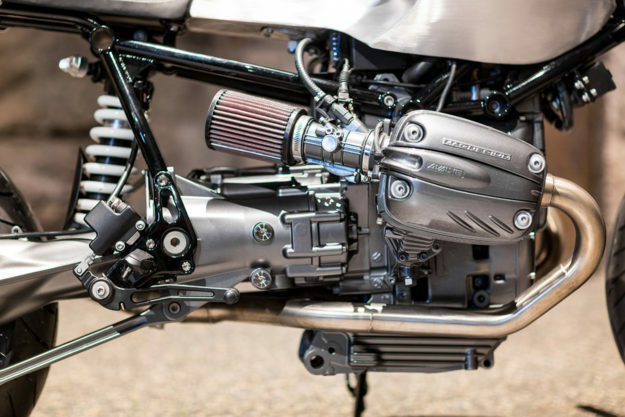 There’s a growing sentiment that BMW’s R1150-series boxers are future classics, particularly the globe-trotting R1150 GS. When 1980s airheads become too old and rare (and there are no stock ones left), it’ll be the ’leven-fifties that go under the knife. 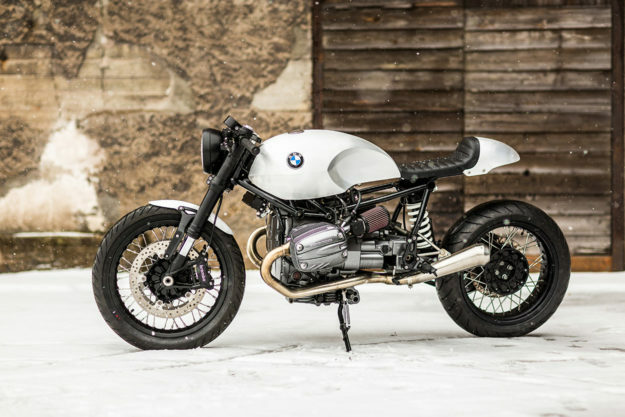 So here’s a glimpse into the future; a stunning R1150 GS-based cafe racer, built by Ronna Noren of Sweden’s Unique Custom Cycles. And it’s a future we welcome with open arms. The project kicked off when Ronna was working on the sunny ‘Flower Power’ BMW for photographer Jenny Jurnelius. 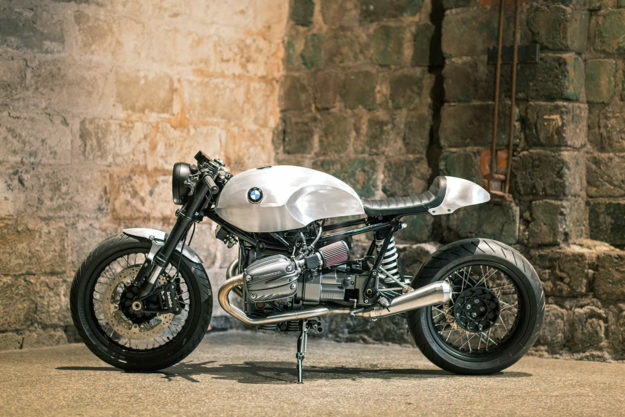 Feeling inspired, Ronna decided that he needed his own BMW boxer racer too. Ronna was actually hunting for a good old-fashioned airhead for the build when the newer ‘oilheads’ grabbed his attention. 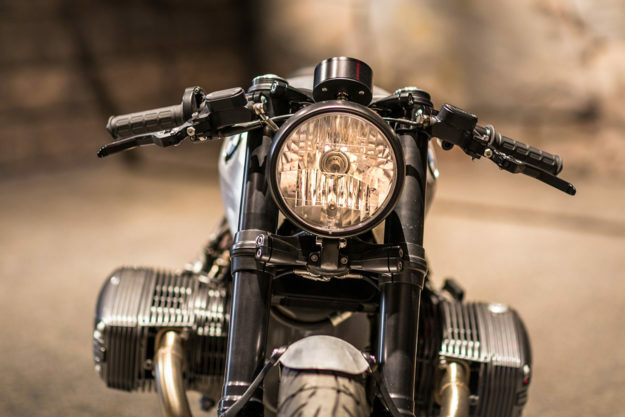 They’re punchy, reliable and easy to come by—and when Ronna looked past the quirky Telelever suspension, he realized the 1150 package could be a solid platform for a cafe racer. 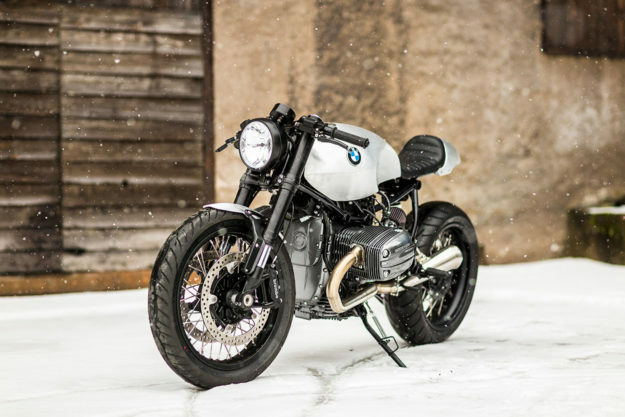 “And somehow they haven’t really been ‘discovered’ yet,” Ronna says, “so they can be found for a bargain price.” He soon located an R1150 GS with a sound engine but a damaged chassis, and set to work. The initial mockup went from racer to scrambler every other day, until Ronna settled on the right rake and trail numbers for a general setup that could go both ways. 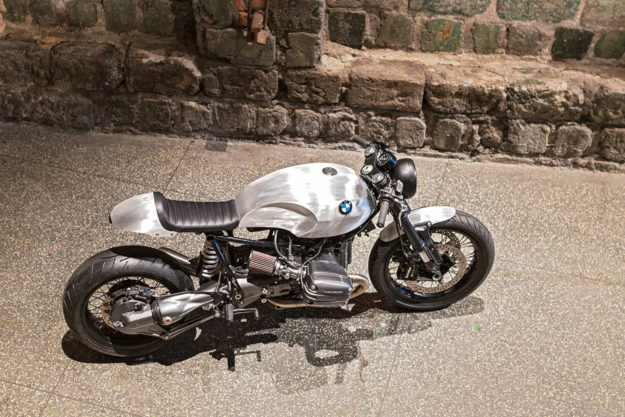 He opted for a low-slung effect for this particular build, and then grafted on a BMW R nineT front end. 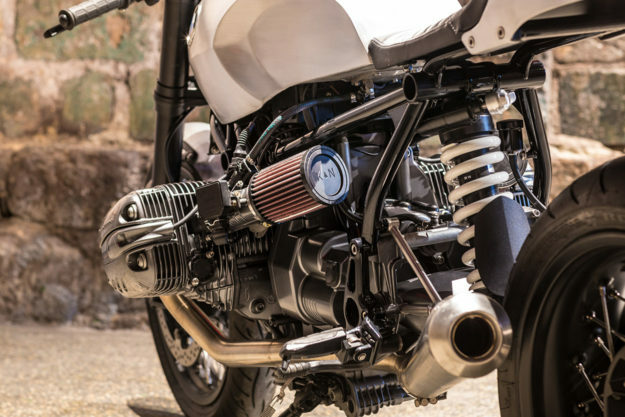 The triple clamps, forks (which have been shortened), front brakes, fender and hub are all nineT items—along with the rear shock. A set of aluminum rims from Morad round out the chassis package; 18” up front, and 17” in the rear. Next on the list was bodywork; Ronna hand-shaped a new tank and tail combo from 2mm aluminum sheet metal. 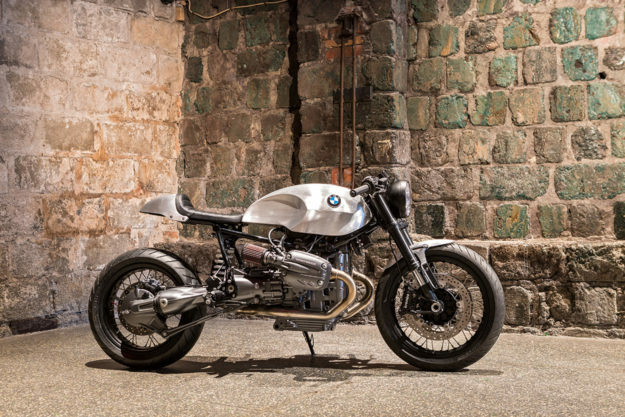 Up top, Ronna modified the R nineT top clamp to remove the handlebar clamps, opting for clip-ons instead. The hand controls came from long-time friend, Acke Rising of ISR, and the instrumentation came from Motogadget. 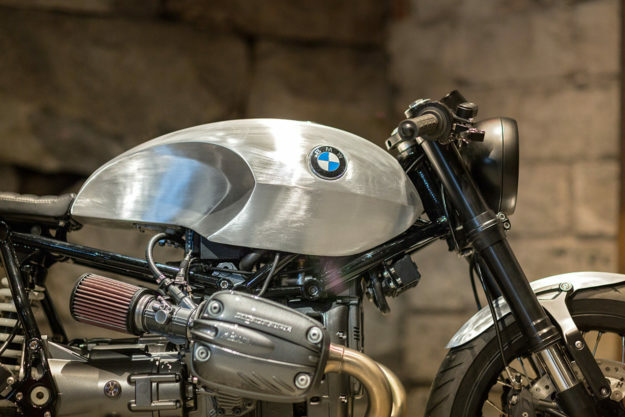 The foot controls are BMW R1100 RS units, and the pop-up gas cap is from Ronna’s twin brother Benny’s company—Tolle Engineering. Ronna finished the R1150 off with a neat, two-into-one exhaust system, terminating it in a Spark muffler. Between the new exhaust, the K&N filters and a remap, there’s now more than enough grunt to launch the 190kg-wet motorcycle off the mark. When it was time for final ‘paint,’ Ronna opted for a raw finish. “My intention was all along to leave it bare and brushed, to underline the pure essentials of this racer,” he explains. Benny then stepped up again, and powder-coated just about everything else gloss black. 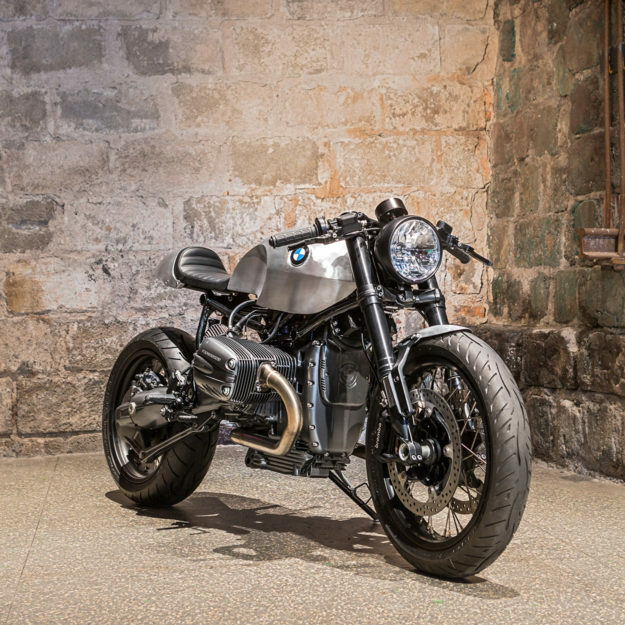 Since completing the build, Ronna’s raced the bike in the Glemseck 101, and taken it to a few shows. But, more importantly, he’s already started on his next project: a scrambler chassis that’ll be running a full suspension package from Öhlins. The age of the oilhead has begun.